Kenjutsu is the study of sword technique that includes sword drawing techniques, batto (cutting techniques), classical sword strategies and techniques. Correct sword posture and footwork are also taught. 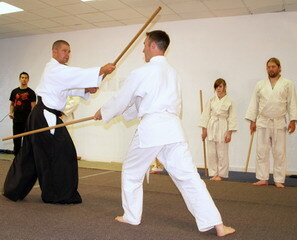 This makes Kenjutsu absolutely essential to the study of Aikido. The jo (also known as "tsue", a walking stick) is one of the traditional weapons learned in association with the Japanese sword. The beauty and grace of the jo techniques as well as its relative ease of use make it one of the most useful weapons. Traditionally, the jo is included as part of the study of Japanese swordsmen. and/or winning or losing outside the Dojo. Sword and Jo classes are open to anyone who has a sincere desire to learn about the history and meaning of Japanese culture. The only requirements are a desire to learn and a willingness to learn in a traditional Japanese manner. You must be at least fifteen years old to join. 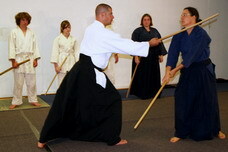 Students learning aikido are encouraged to attend Kenjutsu and Jodo classes to deepen their understanding of the art, as well as anyone with an interest in the sword. There will be no competitions because Kenjutsu is a reflective art aimed to develop the spirit through heightening one's proficiency with the sword. Whether you are a new or an advanced student, special attention is paid to your specific individual needs. If new, you are encouraged to progress but not obliged to go past what you are able or willing to do. The classes are one hour of intensive training and varied enough to insure steady progress in technical ability of even the most advanced student. For more information, click here to print or download Aikido Seikikai's Introductory Brochure.